As a JIRA site administrator, you can disable active JIRA-TeamForge project mappings for one or more or all the projects (Administration > Add-ons > TeamForge Associations) if you want to prevent a JIRA server that's mirrored into a staging/testing environment from triggering events back to TeamForge (when there are changes to issues in JIRA projects that are mapped to TeamForge) thereby polluting the production TeamForge event data store. Use this feature to disable all production JIRA-TeamForge mappings in stage environments and then test the TeamForge Associations add-on by creating a new mapping between a staging JIRA server and TeamForge server. Log on to the JIRA server as a site administrator. 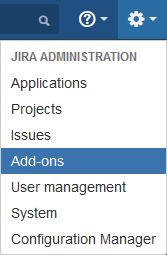 Select JIRA Administration > Add-ons. Select TeamForge Associations > Manage. Select one or more projects from the list to remove the project mapping. Tip: You can select the Select All check box to select all the projects. Click Remove to delete the mapping.